The Packers’ Bryan “Flea” Engel was named the NFC’s winner of the Tim Davey Assistant Athletic Trainer of the Year award at last week’s scouting combine in Indianapolis. The award began in 2010 in honor of Davey, a former assistant trainer for the Jets, who passed away that year. An employee of the Jets and the NFL for 33 years, Davey worked on the athletic training staff for the Jets (1969-77), moved into team operations (1977-91) and then joined the league office in game operations. One assistant athletic trainer from the NFC and one from the AFC is recognized each year by the Professional Football Athletic Trainers Society. Packers head athletic trainer Pepper Burruss, who worked with Davey while with the Jets, presented Engel with the award at the PFATS annual business meeting last week at the combine. 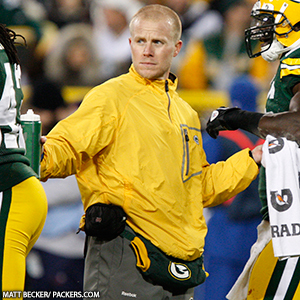 Engel just completed his 17th season as an athletic trainer for the Packers. He began his time in Green Bay as an intern in 1997 following two internships with the New England Patriots. He initially met the Packers’ training staff at Super Bowl XXXI while working for the opposing Patriots and came to Green Bay for an interview just a few weeks after that game. After two seasons as an intern for the Packers, Engel became a full-time assistant in 1999 and has remained with the Packers since, though he never necessarily envisioned staying with one team this long. Engel is the third member of the Packers’ medical staff to be honored in recent years. Dr. Patrick McKenzie received the Jerry “Hawk” Rhea award as the NFL’s outstanding team physician in 2011, while Burruss received the Fain Cain Memorial Award as the league’s top athletic trainer last year.